IU Time Warp 2020 is the newest challenge at The Escape Room USA-Indianapolis. Loaded with IU spirit, trivia and memorabilia, this unique Hoosier experience debuted Sept. 28. "We are very honored to do this," said Scott Neal, a Kelley School of Business alumnus and co-owner of The Escape Room Indianapolis. "We've been working on this room for almost a year." In just one hour, a team of six players must solve numerous puzzles within the four sections of the escape room experience. The storyline and puzzles were developed by Neal and his wife, Marjorie Neal, a nursing alumna from IU Kokomo, in collaboration with the IU Office of the Bicentennial and IU Archives. Well-known IU voices Chuck Crabb and Don Fischer contributed voice recordings. IU Time Warp 2020 will remain open through the end of 2020. Scott Neal said he will continue to add memorabilia and cream-and-crimson details throughout. The room is one of eight he has designed in the Indianapolis location. He has designed rooms for his Fishers and Columbus, Ohio, locations as well. IU Time Warp 2020 has been rated a difficulty level of intermediate. This IU-centric escape room begins when players enter the "time-reversal machine," a shiny, futuristic space complete with special effects. A successful exit of the time-reversal machine takes players into a setting where a world hangs in the balance because research accomplished at IU was never completed. Would America's teeth be as healthy without the research from scientists Harry Day, William H. Nebergall and Joseph C. Muhler, which led to the creation of Crest toothpaste? Would Lance Armstrong, Scott Hamilton and Richard Belzer be alive today without the discoveries of IU School of Medicine oncologist Dr. Lawrence Einhorn, who achieved breakthroughs in the treatment of testicular cancer? Would car crashes caused by drunken driving still be at a staggering 50 percent, which was the rate before the creation of the Drunkometer and the Breathalyzer by IU researchers Rolla N. Harger and Robert F. Borkenstein, respectively? And who the heck would have won all of those NCAA men's basketball championships? If players get past the dystopian society that existed without IU, they then work inside a replica 1883 IU treasurer's office to find the missing money that would rebuild the university. If found, it's back to the future, which is colored cream and crimson. The final room is filled with puzzles, displaying clean smiles, basketball championship banners, and national drunken-driving crash rates that were cut in half thanks to Harger and Borkenstein's inventions. Scott Hamilton is alive and well to give color commentary for Olympic figure skating. The room is full of athletic memorabilia -- football jerseys, old basketball shoes and an old turnstile from Assembly Hall. There is also a tribute to the old Book Nook, an IU hangout from yesteryear that housed the early playing of one Hoagy Carmichael. The final puzzle leads players to an IU Bicentennial plaque and through the turnstile to victory. "IU has been such an important part of society," Neal said. "There have been a lot of phenomenal minds at IU." Neal added that the early reviews have been positive. Kelly Kish, deputy chief of staff and bicentennial director in the office of IU President Michael A. McRobbie, was among the first to experience IU Time Warp 2020, and she recommends it. 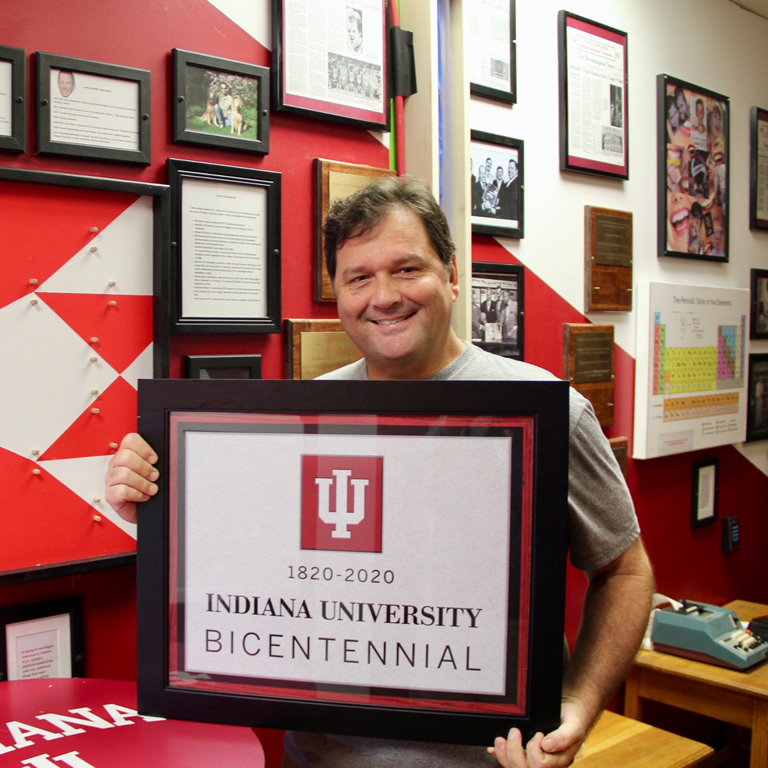 "Our alumni friends at Escape Room Indy came up with a great theme for a time warp through history for the IU Bicentennial escape room," Kish said. "This collaboration allows the public to engage with IU history in a really fun and accessible way." The room posits the question "What if IU were never rebuilt after the devastating fire of 1883?" Of course, in real life, insurance money and generous donations from the citizens of Monroe County got the school back on its feet. But in this time-warped scenario, IU was not rebuilt, and the world is a different place without the university's scientific, cultural and athletic accomplishments.